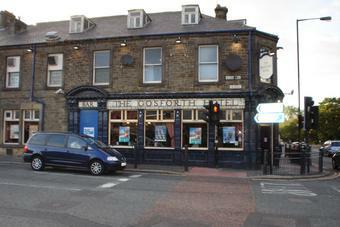 My first stop in Gosforth was the Gosforth Hotel, on the corner at a set of traffic lights. It's very much a locals pub and was busy on my Wednesday evening visit. Sky Sports News was showing on the TV. 6 ales were on. The 2 regulars are Allendale Pennine Pale & Mordue Workie Ticket. Guests were Sonnet 43 Aurora, Sharps Doom Bar, Hadrian Border Grainger Ale & Adnams Ghost Ship. A CAMRA discount is promoted. It turned out to be one of Gosforth's better pubs. I'm the current manager of the Gosforth Hotel and would just like to let people know who haven't been in the pub for a while the changes we have made: 1) the beer we sell is now predominantly local from Mordue, Allendale and other great local breweries, we have just been rewarded for our hard work by being included in the good beer guide 2014. 2) the smell which lingered in the pub for many years has been removed, this was due to poor house keeping and not cleaning a sump in the cellar, so easy to solve. Pop in and give us a try and post you comments on here to let us know your views. Visited last Sunday for the first time since last year. Had a good range of ales (as usual) but my first pint, Doombar, was strangely tasteless and my second, Deuchars IPA, was so watery I couldn't drink it at all. I drink these beers regularly and know how they should taste, very disappointing. A pub of two halves. The front bar is truly awful and smells of the toilets that lead off it. The back snug though is a great little place. I would give the food a miss though. Popped in on a Friday teatime. Fine if you like being confronted with sweaty hairy crevices the owners of which appeared to be divorced builders all moaning about how much the 'ex-missus was taking them for'. Language was beyond choice and very loud. Distinctly offish bar staff. Got a definite feeling of 'we don't like strangers around these parts' - but the locals appeared to get served easily enough. Very average pint of Fullers London Pride. Pity as the building seems to be a proper old style Pub - gernerally speaking the sort of place I would go out of my way to visit. Won't be going back here for a while though.